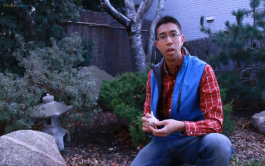 Christopher Wong of Young Urban Farmers youngurbanfarmers.com teaches us how to plant garlic. Christopher stresses getting quality garlic seed to begin and discusses the merits of hard-neck vs. soft neck garlic. Hard-neck garlic is more suitable for cold climates and has a richer flavour whereas soft-neck garlic grows better is warmer climates, matures faster and stores better. When planting, make sure the garlic is planted 3-4 inches deep and approximately 6 inches apart from each other with the root pointing downwards. Covering with mulch such as wood chips or straw is critical to keep weeds out and keep the soil moist.